I absolutely LOVE this look! In my opinion, the braided headband is not a trend because its always in style. However, it does seem to be more popular lately. 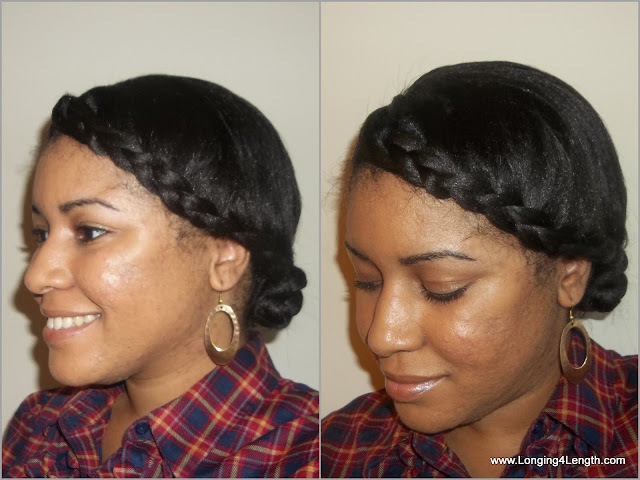 Thick braids tend to look more regal and dressy; thin braids have a bit more versatility. If you are really feeling trendy make two plaits for a double braided headband look, a fishtail band or sling it across your forehead for a bohemian vibe. You can use your real hair, create one with synthetic hair and secure to your head with bobby pins or even purchase a braided headband! I’ve seen them everywhere from Sally’s Beauty Supply and Ulta to Dollar General. Have fun! I need to work on my braiding some more. I’d love to try a few of these looks out! Doing the headband braid isn’t quite as hard actually!